As I mentioned when I was still in Hong Kong, five new books on Conductive Education have been published and some information about them was available at the World Congress. The time has flown since I got back, and what with Christmas too, there doesn’t seem to have been much time to blog. It is quite an event for so many items to be published at the same time and I hope there will be more to come in 2011. Conductive Education Press has plans for three titles and maybe other people/organisations will publish too. More publications are needed, more accurate information, and more clarification, so I hope there will be more very soon. I cannot comment on the quality of these five – it is up to you to decide! Mallett, S. Let me tell you a story. Nurnberg: Conductor Nurnberg. Susie Mallett has selected six of her blog postings describing her work with children and adolescents and put them into a small booklet of 50 pages. This can be purchased directly from Susie at http://www.susie-mallet.org/ for 8.50 euros plus postage and packing and I do have a few copies to sell for Susie if you would like to contact me. International Peto Association. Abstract book; the 7th World Congress on Conductive Education. Hong Kong: SAHK. This collection of the abstracts and poster presentations was given to all delgates at the Congress. If you wish to obtain a copy I suggest you contact Ivan Su at SAHK to see if there are any available. This collection of papers and presentations is in English and Chinese. Contact Ivan Su for information on availability. This book contains chapters on the history of CE in Sweden and Finland and accounts of attempts to use the principles of Conductive Education as an integrated part of the school day in those countries. This is an English translation of the Hungarian edition published a few years ago. Contact Bea at Library@peto.hu for further information. It looks as though a good time was had by all! Graham, J, McGuigan, C. and Maguire, G., eds. Intelligent love; parents’ action for Conductive Education. Recovering from the trip back from Hong Kong has taken longer than I thought but at last I am able to tell you that this book is now available. It has taken quite a while to recruit parents, receive their contributions and prepare it for publication.We managed to get it ready to launch at the World Congress, which we did and now I feel fit enough to post on this blog about it. It is a collection of parents’ reports about their difficulties and efforts to obtain Conductive Education for their cerebral palsied children. These cover the years 1972-2004 and come from parents all over the world, including Margaret and David Clifton, parents of Elliot, who does all the technical things necessary to get CEP books up on Blurb. ‘I could write a book’: frequently heard when parents talk about services for their cerebrally palsied children, and Conductive Education. This book is by thirteen parents and a grandmother, from Belgium, Brazil, Germany, Israel, New Zealand, the United Kingdom, and the United States, each contribution a testimonio in its own right. Whatever your connection with motor disorders in children, this is a book to ignore at your peril, the first collected statement by families of disabled children, one of Conductive Education’s prime beneficiary groups and, in the Western world, its prime mover. These families’ experiences throw light upon questions of how modern societies might do things differently – and better – for children with motor disorders and their families, yet further reminder that progress for disability and for Conductive Education is born out of struggle. Conductive Education is potentially for life – as must be any properly constituted service for those affected by chronic disabling conditions. It is not a program, an intervention, something to be done once, or now and then, or during certain hours of the day, or on certain days of the year, at a given age or in some particular place. Nor it it something that is primarily to be dispensed by a certain kind of person, a ‘conductor’ (however important conductors’ contributions might be to the process as a whole). It is more than just pedagogy. It embraces and transforms every aspect of children’s lives, everyone and every activity involved in their upbringing, a whole new lifestyle. Conductive upbringing and a conductive lifestyle. No short order but, witness the content of this book, it can be done. We would like to thank all those concerned very much indeed for taking the time and trouble to put down their experiences for us. Please do let us know what you think of it. I have never been to a conference before so this was a very interesting experience for me. Initially I thought I would dip in and out but got hooked and attended as many sessions as possible. It was two days filled with parallel presentations which meant I was unable to go to all those I wanted to hear. People from all over the world presented and I learned about what was going on in Israel, UK, Hong Kong, mainland China, Australia, Mexico and Germany. Over the two days I met people who had only been names to me before and was able to learn more about them. 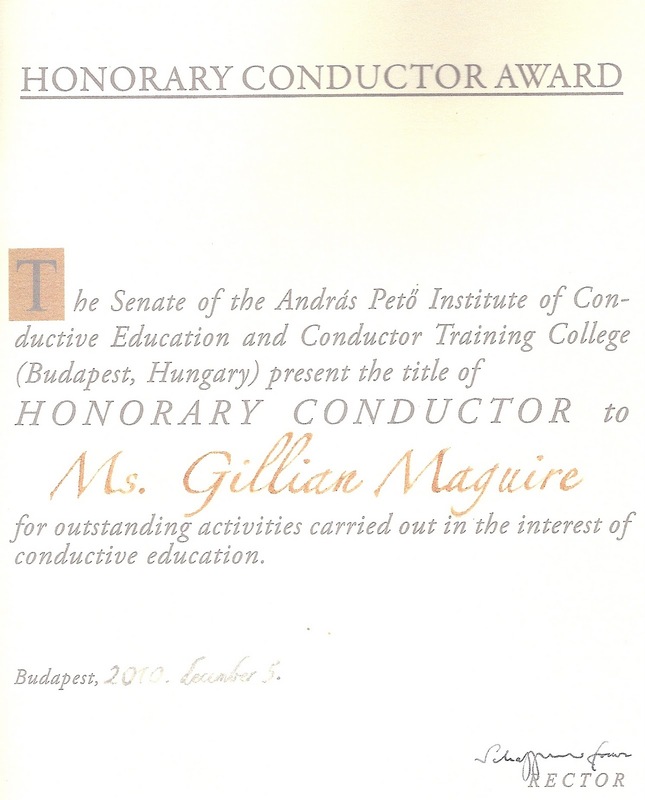 Of course, the main reason I went was to receive my Honorary Conductor Award. I am pleased to say that Edith Yeung is also a librarian working for SAHK. I had hoped to visit her library but the busy schedule of the congress and the study tours afterwards made it impossible. An excuse to go back some day perhaps! The presentations were made at a banquet on the Sunday evening after everyone had watched a Lion Dance and listened to the SAHK children’s Brass Band. All great fun. 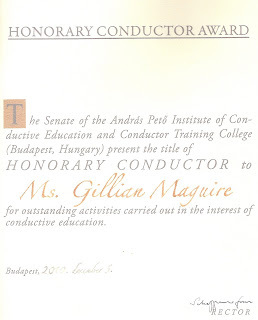 My award was presented to me by Franz Schaffhauser, Director of the Peto Institute and I now have a beautiful red leather folder embossed with the Peto Institute’s name containing a certificate detailing the award. I was very relieved to get up on to, and off the platform without any mishap due to nerves. After this I was lucky enough to sit with a group of people who were excellent company and we all enjoyed a traditional Chinese dinner of soup, fish, meat, noodles, rice, more soup, more fish and little cakes in copious amounts. I would like to thank all those who made this possible very much indeed for an evening I shall always remember with pride and happiness. Around the world in ten days – almost! I arrived home in Birmingham yesterday lunchtime after what seemed to be a never-ending journey. It was 24 hours since I had left the hotel in Hong Kong and I was very tired indeed. How people can do this all the time amazes me. On the way out to Hong Kong I stayed over in Dubai for a day with my nephew, a journalist, who lives there. All was on a very large scale – everywhere were tall buildings, construction projects and a very efficient road system. He took me up the tallest building in the world, the Burj Khalifa and round the largest shopping mall in the world on the way to seeing a Fountain display, the water ‘moving’ to music. In the evening we took a short boat ride across the creek to the souks where spices and medicines are sold before having a very tasty Arabic dinner. Fabulous. I was up early next morning and back to the huge airport for the next stage of the journey to Hong Kong, arriving late at night to a kaleidascope of bright lights. Hong Kong ws a wonderful place to visit and everyone I met was very helpful and extremely polite. Temperatures were in the early 20s so it was even more wonderful to be there after the freezing cold in the UK. The city was very clean, well organised and easy to get around enabling me to visit most of the places on my list in the time allowed. I saw the Big Buddha, had lunch in the buddhist monastery, visited Taoist temples, went to several street markets, had a trip round the harbour at night, crossed over to Kowloon on the Star Ferry and had coffee in the former headquarters of the Hong Kong Police Force – now converted into a shopping mall with restuarants and coffee bars. On my last day I went up to the Peak by cable car for the fantastic view. Here as everywhere there were more shops and restuarants! It was windy and cold and a little misty (unless that was pollution, hard for me to tell) but well worth the effort. I was lucky to do all these things in the company of some wonderful friends – so thank you to all who came with me and made it so enjoyable. This was all fitted in after, and round the conference, which I will talk about later. Now it is time to unpack, do the washing and start thinking about Christmas. This is only a quick posting as there is still a lot going on here at the World Congress. Unlike Andrew I have not been able to post every day as I do not have a laptop or notebook of my own. Since I arrived I have met people who I only knew via the Internet or publications which has been wonderful. Of course no-one looks as I had imagined and they were probably surprised in the same way on meeting me. In the process I have found out about three books that have just been published in English and one in Chinese. Full details about these will be posted when I get home at the weekend as I have the use of this notebook (courtesy of Susie Mallett) for a few minutes before going into the final part f the programme, the Plenary discussions on the essence of CE and the future for it in the 21st century ö no doubt Andrew will report on these later. Well its nearly Congress time and I start my journey to Hong Kong later today – weather permitting. It is still snowing here and I am watching the news for updates on the situation at the airport. 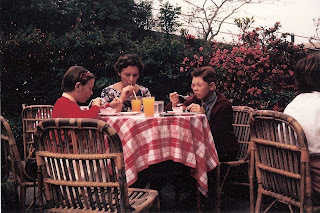 The above photo is of my brother, mother and I enjoying refreshment at the Peak in Hong Kong quite a long time ago. I hope to go up there again, enjoy the view and have another ice-cream next week! I am looking forward to meeting all the people I have ‘spoken’ to via email, whose papers I have read and who contributed to the National Library of Conductive Education whilst I was Librarian. Its my first visit to such an event and it should be an interesting time.